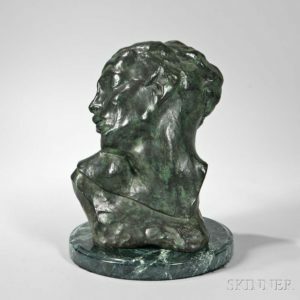 Rodin and Fragments | Skinner Inc.
Two bronze sculptures by Rodin will be offered in our May 19th American & European Works of Art auction. Both were conceived by the artist as parts of larger works, and can therefore be considered fragments, but both also stand as unique and expressive works of art in their own right. Tête de la Luxure (Head of Lust) (Lot 385, Estimate $8,000-12,000) was first created as the head of the figure Crouching Woman, one of Rodin’s favorite compositions, likely originally dated to 1881-82, and one of the earliest figures Rodin modeled for the Gates of Hell. Crouching Woman has been compared to Michelangelo’s Crouching Youth for its vigorous modeling and vitality. Later the fragment of the head of Crouching Woman was issued separately as Head of Lust, created in plaster in two sizes, the smaller measuring 5 ¾ inches high, and the larger measuring 15 1/3 inches high. Bronzes were then cast by Alexis Rudier. Rodin undoubtedly was pleased with the outcome, since he gave one of the early bronzes to the Victoria and Albert Museum in 1914. The Gates of Hell was a commission received by Rodin in 1880 for a decorative arts museum planned in Paris. Although the museum never opened, the project occupied Rodin for 37 years, and he created a full-scale plaster model in his studio, adding, removing, and altering the over 200 figures that comprised the composition. Many of the pieces were eventually enlarged and cast or carved as independent pieces, including such signature works as The Thinker and The Kiss. The initial inspiration for The Gates of Hell was drawn from Dante’s Inferno, a source that freed Rodin to experiment radically with pose and gesture, expressing the range of human emotions from suffering and despair to sensuality and maternal love. The doors were not cast in bronze during Rodin’s lifetime, but in 1925 Jules Mastenbaum commissioned two sets in bronze, one for the new Rodin Museum in Philadelphia, the second for the Musée Rodin in Paris. Grande Main Crispée Gauche (Large Clenched Left Hand) (Lot 301, Estimate $120,000-180,000) was originally modeled by Rodin c. 1885. The hand is often thought to have been a study for The Burghers of Calais, which was repurposed in the course of the monument’s development. Rodin often worked in fragments, not relying on the whole figure to communicate his intent. He would also take fragments from various sculptures, issue them as individual works or sometimes combine them into new, unique sculptures. Hands always fascinated him for their expressive capacity, and through them, Rodin conveyed profound emotion, from anger and despair to compassion and tenderness. 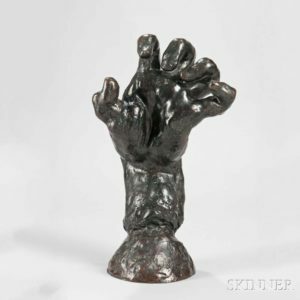 The sculpture at hand is the sixth of eleven known casts by Georges Rudier made for the Musée Rodin between 1965 and 1974. Other examples from the series may be found in the collections of Stanford University, Paolo Alto, and the Metropolitan Museum of Art, New York, both as gifts from the Iris and B. Gerald Cantor Foundation. There is an earlier Alexis Rudier cast, c. 1925, in the Rodin Museum in Philadelphia. 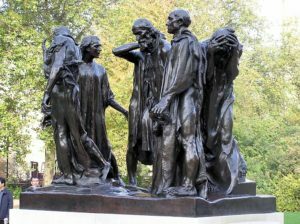 The Burghers of Calais is one of Rodin’s best-known works. It was commissioned by the leaders of Calais to commemorate the year-long siege of the city by the English during the Hundred Years War, when the English demanded the surrender of six of the town’s leading men, or burghers, in return for sparing its citizens. Rodin received the commission in 1884 and completed the work in 1889. Radical in its approach, the burghers, wearing sackcloth and tied with rope, stand at ground level as flesh and blood men facing struggle and probable torment. This defied the popular expectation that public sculpture should elevate, both figuratively and literally, a positive image of glory expressed via heroic or allegorical figures placed appropriately on pedestals. Rodin, however, had a different plan, to recognize the glory of self-sacrifice in these very real men, honoring their strength of character and their suffering, and meeting them not elevated but face to face. One can imagine the same effect of awe when the sculpture, confiscated by the Nazi’s in World War II, was found abandoned in the woods outside of Neuschwanstein Castle by the Monuments Men. View all lots featured in Skinner’s American & European Works of Art auction here. This entry was posted in Blog and tagged artwork, Auguste Rodin, boston, bronze sculpture, fine art, French art, French artist, masterwork, Rodin, sculpture, skinner, skinner auctions by Elizabeth Haff. Bookmark the permalink. I have two notes signed by A. Rodin. They are separtely framed and mounted in acid proof matts. I purchased these in NYC in the 40’s. I am interested in selling both. Our Appraisal team will work together with our Fine Books, Manuscripts & Historical Documents Specialist. Thank you very much!